When it comes to sheer brio of presentation, few directors in Boston can rival David R. Gammons. 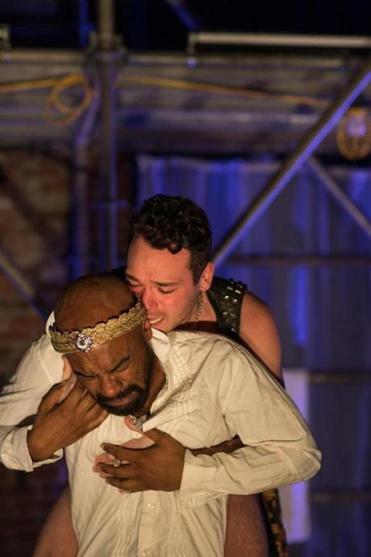 For this Actors’ Shakespeare Project staging of Marlowe’s 16th-century drama in Charlestown Working Theater, Gammons has streamlined the play to focus on the mortal stakes surrounding the gay relationship at its center. At first, the story feels both thin and repetitive, but the tension steadily builds as forbidden sexuality collides with power politics. When the consequences start to unfold for everyone onstage, Parent’s portrayal of the titular monarch reaches a level of transfixing intensity. Among other things, the performance by this consistently charismatic actor puts an emphatic exclamation point on the beginning of Parent’s tenure as co-acting artistic director (with Paula Plum) of Actors’ Shakespeare Project. Edward is ultimately undone by his passion for his lover Piers Gaveston, portrayed with seductive insinuation by Eddie Shields (SpeakEasy Stage Company’s “Casa Valentina’’). Their unstoppable attraction to each other, made palpable in a sinuous carnal ballet near the start of the play, betokens a consolidation of power that is given literal form when Edward invites Gaveston to take a seat on the royal throne. Their union poses a threat to two cruel and scheming noblemen, Mortimer (Alex Pollock) and Lancaster (Nigel Gore). The lengths this pair will go to are suggested not just by their vicious words and baleful looks but by the sheathed knives each wears on his hip. Both are attired in black leather (costumes are by Rachel Padula-Shufelt), while Edward wears a combination of contemporary garb and Elizabethan-era kingly raiment. Under pressure from Lancaster and Mortimer, Edward agrees to exile Gaveston, but shortly calls him back to the palace. Edward’s rivals are not done scheming, however. In addition, Edward’s queen, Isabella (Jennie Israel), wounded by his unfaithfulness, eventually turns against the king. The atmosphere in Act 2 increasingly edges into claustrophobic, all-enveloping menace. Jeff Adelberg’s shadowy lighting grows even more so, and director Gammons again illustrates his gift for immersing you in the worlds he creates onstage — a gift evident in his buoyantly joyful “The Comedy of Errors’’ at Actors’ Shakespeare Project and the spooky shock-fest of his “Hand to God’’ at SpeakEasy Stage Company, just to name two. His “Edward II’’ manages to seem both of its time and of our time. Pollock brings an eerie stillness to his portrayal of Mortimer. The actor’s gift for playing alienated, off-kilter characters (“The Aliens,’’ “The Flick,’’ “This Is Our Youth’’) has seldom been put to such darkly compelling use. Pollock’s Mortimer is pure sociopath all the way, devoid of conscience or feeling; even under torture or at the point of death, Mortimer projects an air of creepy imperturbability. As Lancaster, Gore projects the bravura command that is one of his trademarks. As Isabella, Israel captures the nuanced evolution of a conflicted queen who (in this production, anyway) makes an initial claim on the audience’s sympathy. Solid support is delivered also by Nile Hawver as Kent, brother to the king, caught in the crossfire; Stewart Evan Smith as Spencer, who becomes Edward’s favorite and ally after the murder of Gaveston; and David J. Castillo as Prince Edward III, who faces the challenge of doling out justice when all is said and lethally done. Presented by Actors’ Shakespeare Project at Charlestown Working Theater, Charlestown. Through March 19. Tickets $30-$50, www.actorsshakespeareproject.org, 866-811-4111.